Dear Sir Roger, I was happy to find You in the internet. Thank you for Your all great roles I have enjoyed since a school girl. You were the first James Bond I watched in movies and before that I watched The Persuaders on TV. I wonder if there is any role You still would enjoy to do but have not played so far. And to answer this You can choose to be any age you like for the role. I enjoyed to read My word is my bond last summer. You have extremely good memory with the details of your life. I was very impressed. Have a great Summer and stay healthy. All the best for You and your lovely Lady Kristina. I can’t really think of any role I’d like to play today – but would have loved to be Lawrence of Arabia! Or maybe a villain in a Bond movie. They always had the best lines. Thank you for answering my question about your wonderful show The Persuaders. In your reply you mentioned a possible movie, and that you might like to play the character of Judge Fulton. Laurence Naismith was excellent as the Judge. I know time marches on and I’d bet you’d be also be fantastic in that role if there were a movie made now. It makes me think however that no one but you and Tony could possibly be Brett and Danny. If Tony were still with us I think it would have been great fun to see you two together in those roles again. I know you have said you would never reprise the role without Tony and I have always thought you had such integrity to take that view. My question is would you have done it again if Tony were still with us, or do you think it’s best to leave the marvelous original show alone? I’ve always thought you were a true gentlemen and have respected and admired you greatly, and your taking time here to reply to your fans makes that even more evident. I’ve enjoyed your films and I still think The Persuaders is the best show ever on television. The fun you and Tony had definitely translates to the viewer like no other show. I still watch the DVDs every weekend. 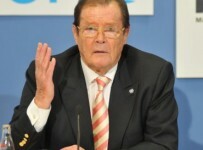 Thanks again for answering my previous question Sir Roger. I hope this new question reaches you in time and that you’ll get a chance to reply to this one as well. It is often a mistake to go back to a show that was successful, BUT if there had been a good script for Tony and I as ageing characters – perhaps introducing our sons – that we could play believeably, then sure. Now Tony is gone, I’m not so sure it would work with me alone. But who knows …? My local newspaper here in Stavanger, Norway recently ran a retrospective from the time The Saint raced the local stadium, first on a motobike and then in the familiar Volvo. It was october 1967. The article says you were to arrive at the stadium in a helicopter, accompanied by Norwegian broadcaster, Knut Bjornsen, but alas the helicopter had engine trouble. You then arrived by car, spontaneously stopping by a local familiy to have a glass of milk (!?). Well, if you need one, you need one! At the stadium you raced Bjornsen on a motorbike, but when that did not seem too successful, you changed for the Volvo an quickly gained the lead. Mr. Bjornsen tried to overtake you, but was then thrown from the bike in a curve. Shaken and a little bit stirred he got to his feet and was picked up by you in the Volvo and driven across the finishing line. Do you remember this incident at all? I remember visiting Norway, sure. And showing off the Volvo. I’m not keen on motorbikes, as I’ve never felt very safe on them, so its four wheels for me every time. I’m just about to head to Norway again, though this time by ship on a cruise around the Fjords. I’m deeply saddened by the awful atrocity there, and can only imagine the huge grief Norway feels right now. It’s important the tourists still visit your country though, and I’m pleased to do my bit. Firstly what is the process of actually recording a commentary on a DVD. Do you actually sit in front of the DVD being played and record your thoughts as the film plays out?, and how long did it take you to record all the commentaries that you did for the Bond films-is it like one a day? Secondly how do you enjoy watching your movies these days? DVD, Blu Ray or do you still like to visit the cinema and view on the big screen. The Bond DVD commentaries were recorded in a hotel in Monaco. Huge duvets were hung over the windows to drown out any noise! We did one or sometimes two a day, with a break for lunch and I literally sat in an armchair watching the movie while John Cork asked questions to prompt me. So it took about a week in all. I don’t particularly like watching myself, as it makes me think how handsome I used to be. We watch our movies on DVD thesedays. I don’t yet have a BluRay … unless a manufacturer wants to send me one?! You are one of the best dressed men ever. Cyril Castle and Douglas Hayward have played an important role in that. In your commentary on the DVD The Man Who Haunted Himself, you mention that you even had made 15 copies of the same tie. You must therefore have owned numerous suits, ties, and shoes. Do you have pieces of clothing that – although worn out (a bit) – you still like to wear or will never throw away because they have a special meaning to you? If so, what are they? I wish I could still get into them all ! Alas all those suits have gone over the years. I did keep a pair of boots from For Your Eyes Only which, although I’ve had re-soled, are still very comfortable and warm in the snowy hills of Switzerland. Not bad for a 30 year old pair eh? On June 20th I attended the John Barry memorial concert at the RAH. I have loved John Barry’s music since I was a child (my dad had the theme to The Persuaders which got me hooked). I also know Michael J Lewis, who scored 3 of your films. Did you as an actor ever get involved with the music for your films, or was that area a complete ‘no go’. I’m under the impression JB did not like any interference from anyone! Also, I live on Clapham Road, SW9, minutes away from your childhood home on Albert Square. It’s such a beautiful place (the square, not Clapham Road, obviously). Just wondered if you ever check it out on your trips to London? Would recommend going into The Canton Arms at the bottom of Alderbert Terrace if you do – the food is amazing!! Yes I heard the concert was a huge success. I knew John of course (and Michael Lewis – who was a friend of Bryan Forbes, and therefore involved in two of Forbes’ films) but never really discussed music with him. After all, what does an amateur actor know about such things? I last visited Albert Square about three years ago. It hadn’t changed much on the outside, though I suspect prices have rocketed now.